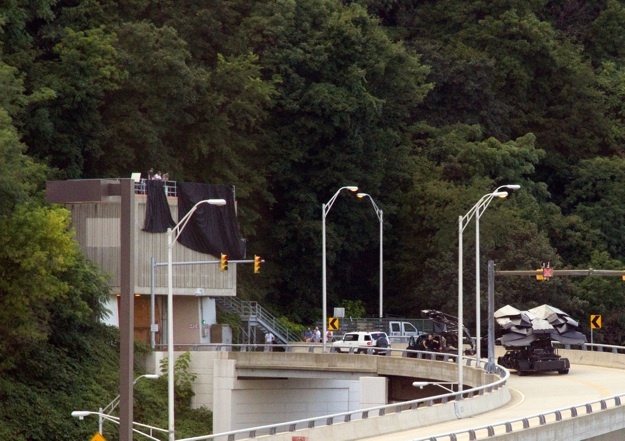 JeremyJahns.com: New Bat-Vehicle Spotted In The Dark Knight Rises? When I started this website, I didn't intend for it to be a "Batman fan site", but the pics just keep on coming. 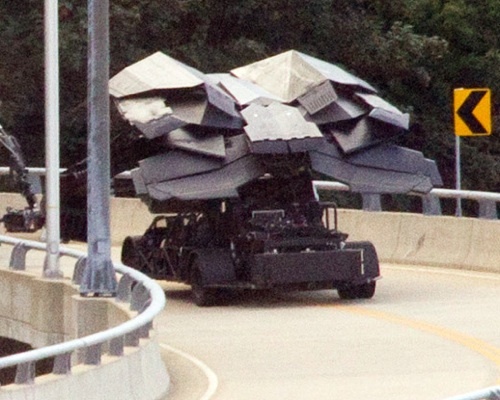 The latest picture to hit the web is speculated to be a new vehicle in TDKR. Click the jump to check it out. While the function of this new craft...or...."thing" isn't known for sure, the speculation has already begun. Air craft? Water craft? Or a prop piece in a Metal Gear Solid fan film? It appears to have wings that are folded inward, so I'm calling "Air craft", What do you think? as always, let me know. New "Metal Gear Bat"...at least that's my name for it. It appears to be on that truck to make it look like it flies, so Imma have to stick with AirCraft. it's probably the new batmobile 99.99% sure. It's the batwing, confirmed now. its like a mix of a helicopter and a plane. it must have some blade system to keep it up and then the turbines to push it forward. very funky, but interesting design. gotham must of turned into a war zone or something. jeremy, what do you think of joseph-gordon levitt (u know him. the guy from inception and 50/50) being casted in the dark knight rises? i think it's pretty awesome. especially if he plays Nightwing. could you do a blog or video about it? Looks like a miniature stealth fighter plane. You know like the ones that fly under radar. If that beast is really in The Dark Knight Rises; i can expect nothing but badass.